Noble intentions, combined with compassionate actions, produce universal loving kindness. Bodhichitta, or Buddha nature, is within each and every one of us. By dropping our selfish interests and behaviors, we allow this nature to be exposed to all who are around us. The clinging (upadana) to old habits and unskillful acts only serve to keep us covered in a veil of illusion. I, me, mine, only preserve our suffering and inhibit the escape from samsara. This endless cycle of birth, death and rebirth, are exemplified in how each of us is dissatisfied with our current condition. And if you feel you are satisfied with your current condition, can you say that it is permanent? Of course not. It is this sort of thinking that perpetuates grasping and clinging to the goal of temporary personal gratification. As I prepare to take my precepts this weekend, so much thought and reading has brought me to a few epiphanies. 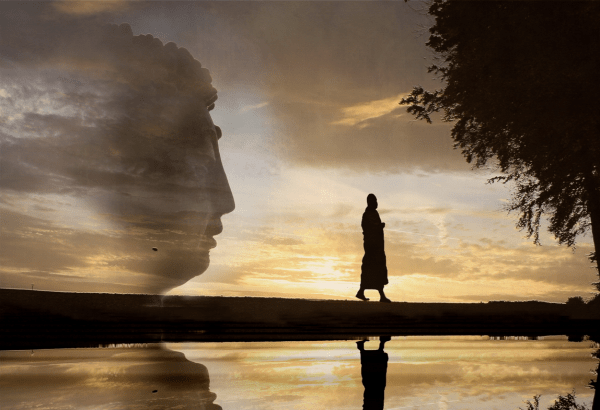 Beside taking refuge in the Buddha, the dhamma (teachings), and the sangha (community), I also see that I take refuge in those three refuges that exist within the self. Meaning that the Buddha is within all of us. The teachings are there, and the community is there. We each have everything we need to live compassionately and genuinely. Additionally, I have come to realize that the precepts are not at all rules, and they are far more than a mere moral code. Upon deeper examination, one can see that they each offer profound teachings. For example, the first precept is to give up killing. And is it not true that your words can kill someone’s ideas, or bring upon the death a friendship? Just as the second precept is not to steal, and could your actions not steal someone’s future or hope for the future? Explore each of the precepts for yourself, and see what you discover. Expose the Buddha that already exists within the self. You are a good person! Personally, I have taken the precepts a long time ago. And only now am I beginning to understand some of their true meaning. I truly look forward to taking these precepts with the Sangha this weekend. It is not something to be kept secret, but to share openly, just as the community shares their loving kindness, compassion and equanimity with me every day. May we all live in peace, harmony and with generosity. And may you each be well, happy and peaceful.